If you ever encounter someone in sudden cardiac arrest, you�ll want to help. 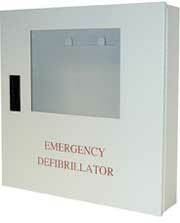 CPR is not enough�defibrillation is the only treatment for sudden cardiac arrest. Medtronic, the world leader in medical technology, created the LIFEPAK CR Plus defibrillator specifically for the first person at the scene of a sudden cardiac arrest. Designed for the minimally trained and infrequent rescuer, it�s easy to understand and use in a cardiac emergency, when every second counts. It�s just plain simple. The CR Plus offers the quality and performance preferred by the vast majority of emergency medical teams around the world. Sleek and lightweight, the CR Plus uses the latest ADAPTIV� biphasic technology and upholds the standards of excellence found in all LIFEPAK products. The CR Plus is available in a semiautomatic and fully automatic model. With the semiautomatic CR Plus you assess the person in sudden cardiac arrest, then open the device and apply the electrodes. The device analyzes the heart�s rhythm and tells you to push a button if the heart needs a shock. The fully automatic CR Plus requires just the first two steps, and the device does the rest. One (1) CHARGE-PAK� Battery Charging unit, a long-life low-maintenance battery charge unit designed for low or infrequent use environments. A new battery charging unit may last up to 2 years when installed in the LIFEPAK CR Plus AED under optimal conditions. Set of two (2) QUIK-PAK pacing/defibrillation/ECG replacement electrode pads. QUIK-PAK electrodes enable rapid access, incorporating an easy pull handle with written and graphic prompts. The electrodes are compatible with all devices and connectors that can use QUIK-COMBO� electrodes. Infant/Child Reduced Energy Defibrillation Electrodes Compatibility � use only with LIFEPAK 500 AEDs with a pink connector or any LIFEPAK CR� Plus defibrillator. 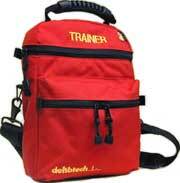 Intended for use on children less than 8 years of age or 25kg (55lbs). Infant/Child Electrodes are smaller than adult defibrillation electrodes. The electrode reduces the energy dose delivered to the patient by a factor of four. 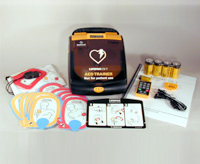 If the AED is set up to deliver a dosage of 200, 300, 360J using adult defibrillation pads, the dose will be approximately 50, 75, 86J with the Infant/Child Electrodes. Durable, soft-shell, grey carry case for LIFEPAK CR® Plus AED.